A website is like your receptionist! They need to look good for making a good first impression on your client. Most of us like a dynamic partner and Flash websites are perfect partners for your business. Flash sometimes makes websites look cool, attractive at the same time professional. The main glitch in Flash is nothing but using the software to piece the perfect website as it consumes a lot of time and money. Here is a quickfix for that problem: go shopping for to find your favourite flash apps at these places. Although they are not free, but some of them are really bargain, which can saves you hours of development time. 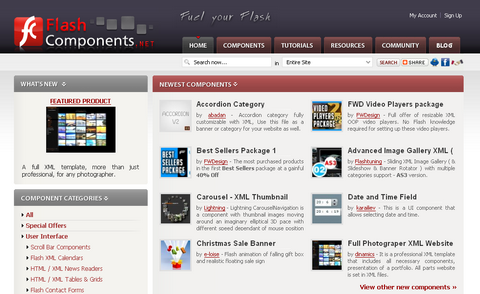 Digicrafts is an excellent place to start shopping for your flash apps. 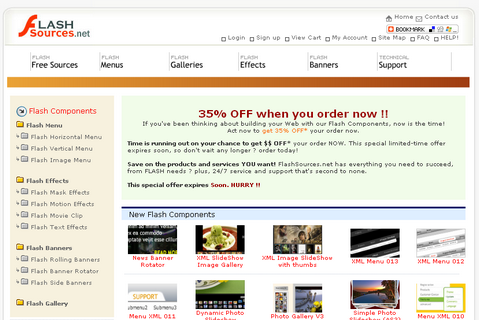 It offers templates, banners, menus and other flash items for sale. They gallery is categorically organised under different creation tools like Flash, Lightroom, Dreamweaver etc as well as in application form type like templates, logo, clip arts etc. It also offers an excellent integrated search options that can reduce your shopping fatigue. The site also provides freebies as well as tutorials for their applications. JumpEye really makes your eye jump! The website offers a very simple interface to browse through their repertoire which contains a wide range of flash components. They also package these apps as a unit which can assist you if you are looking for a complete makeover of your website. Their FlashEff software which is an action script viewer for Flash, where you can create as well as edit their components. They also offer many web apps like Media player, Text Box, Interactive Map to just name a few popular ones. The eBay of flash applications. You can easily set up your account and start bartering your flash applications. This website contains a huge variety in flash applications and components to suit a wide taste as well as the pockets. The site is very methodical in its organisation which gives users a hassle free experience. The site also has an exhaustive integrated search service as well as a strong community who can help you at any time! 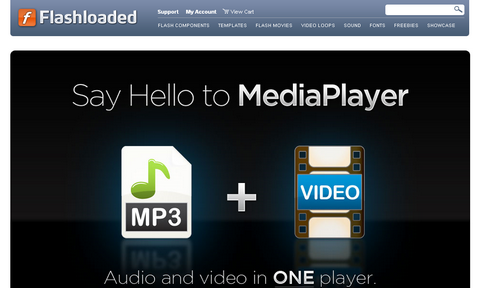 FlashLoaded is loaded with flash apps that can blow your brains out. They offer integrated flash packages to suit specific website requirements as well as individual flash components to help to tune your website. The website is visually appealing as well as logically organised which can assist you in your quest to find the best flash apps in the world ofInternet. 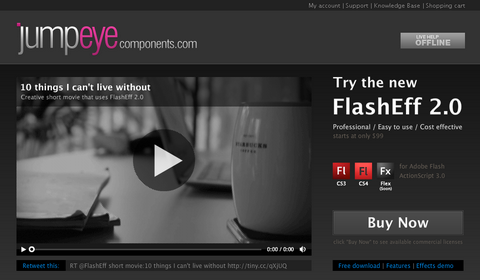 The website also covers domain of Flash Movies, Video loops, Font as well as sounds. 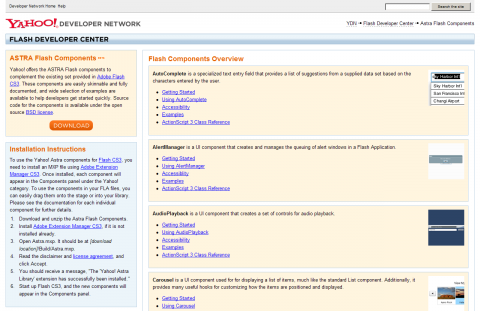 Advanced Flash Components (AF Components) is a site of advanced flash action scripts components to help make your website more awesome. In nerdy terms, these components help extend functionality of your website, speed up your websiteprocesses and assists in delivering a high quality product! They offer components for advanced functionalities like media player, slide show, interactive menus etc. 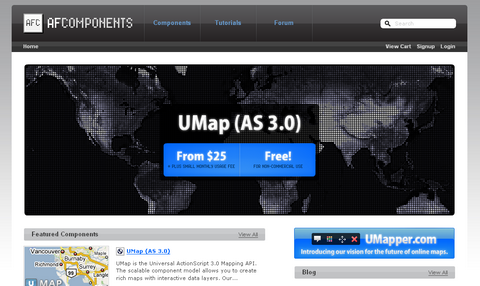 Their Interactive Map has created a huge buzz around theInternet community as it is the most advanced map of the world. 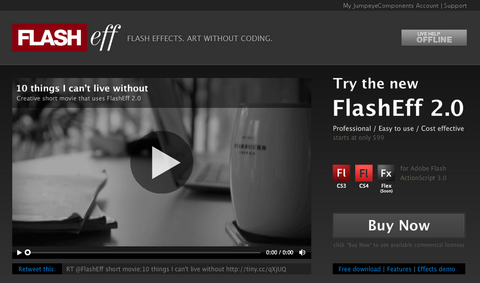 FlashSources.net is an excellent online source for flash apps and now they are on sale! They provide a gamut of basic flash website components from effects to menus to help you with your very exactingrequirements. On top of it, they offer 24×7 support for all of their products. FlashEff is an acronym for Flash Effects, it helps creates tools for flash applications without the trouble of scripting all together. It has an virtually library of unlimited components and allows to edit them as well add new to the FlashEff database. The version 2.0 has improved user interface and better performance compared to previous versions. The FlashEff database has an amazing array of tools to help you tweak flash apps to suit your needs. The Craig’s List of Flash applications. You can buy or sell anything related to flash here. 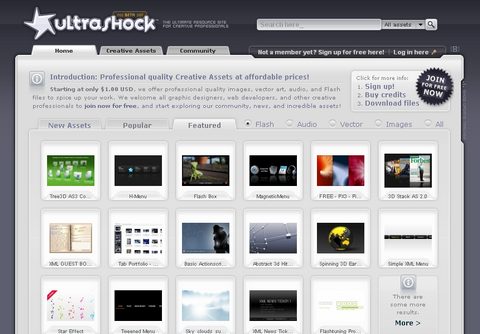 Ultrashock offers a comprehensive database on professional images, vector art or flash files. The website provides a super easy navigation experience and a well organised database so that you can get what you want in the least time as well as the easiest way possible. This is Yahoo! flash components developer network which by itself gives users a wide selections components under the BSD license. You need to download their Yahoo! Astra Components extension (.mxp) in Adobe Flash CS3 to get access to their database. Moreover, you can get easily access to action scripts of the application in order to edit it as well as develop new code. The website offers a succinct view of their components. 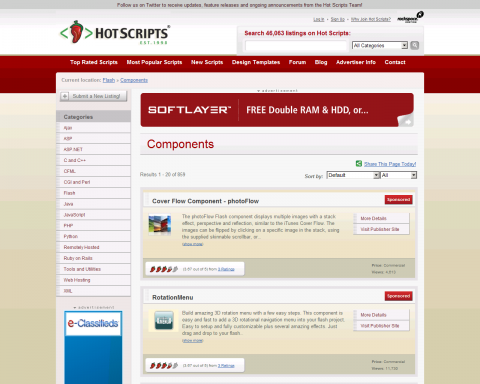 HotScripts contains a huge database of components in flash which can be used for any and all website needs. At HotScripts, you will be able to get tools for any website requirments and can even fit in your wallet. The search provided here is basic, but you can never find this huge collection of flash components anywhere else in the whole wide web since 1998! 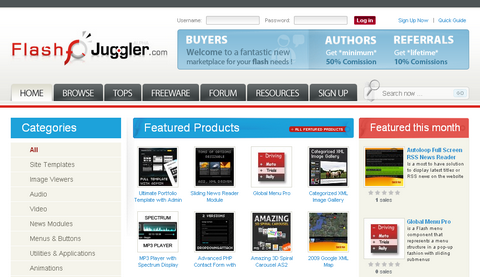 An online marketplace for flash tools, the flash juggler provides access to gamut of flash tools. The plethora of applications can put some of the new shoppers in a conundrum, and FlashJuggler has juggled this problem by keeping track of application popularity. Moreover, the site provides access to freeware. If you are a developer, then FlashJuggler offers a sweet deal; you get 50% of sale price and 10% of referrals. Start juggling your cash! FlaBell has a flair for Flash applications, in complete packages to meet your software requirements. The FlaBell provides an intuitive interface to help you search through their comprehensive database tools. It offers search criteria as per downloads, most viewed, most popular etc to give the buyer a circumspect of an application. Buy Stock Flash offers platform for anyone to market their flash applications. From the shopper point of view, this increased competition gives them a wide selections as well as competitive pricing. In layman, It is a farmer’s market. The website providers also provide user with views on most popular items, most downloaded ones, new additions etc. Words! Words! Words! Words can colour images that cannot be expressed in pictures and a good flash text effect tool can give life to your pictures. The TextEff 2 is the best among flash text applications and offers a lot of tools to assist you create real moving texts that can create an impact with users. 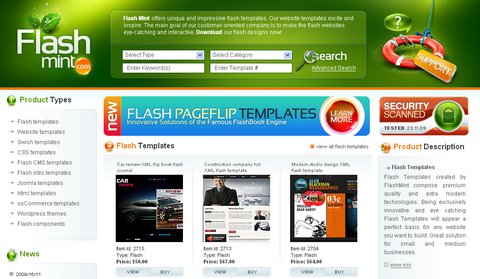 FlashMint is an exclusive flash templates website, from where you can buy flash templates. Unlike other websites, the FlashMint deals exclusively in flash based website templates and has accrued a large repository of templates. The website is well organised and provides an excellent search options which can help you navigate through their resources with ease. ActiveDen is an Envato Marketplace. At ActiveDen you can buy and sell royalty-free Adobe Flash and Flex files for just a few dollars. Items are priced on the complexity, quality and use of the file. The site is home to a bustling community of Flash designers and developers and is the largest Flash library on the web. That was the same question I was going to ask. Activeden is the one I use the most and it wasn’t even on the list. I was reading this post in my RSS reader, and the RSS was not updated, so I came here wanting to ask the same thing as the first person… where’s Activeden? I see you updated the post. 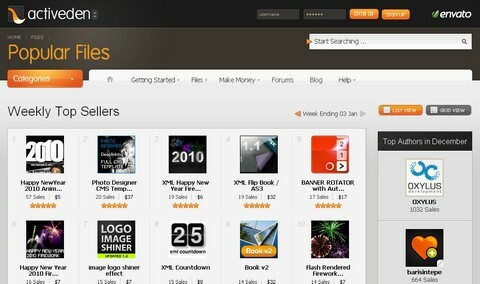 IMHO, Activeden should be number 1 on this list, since they’ve got the best files/services out of all sites presented. Thanks for mentioning about our Flabell start-up! 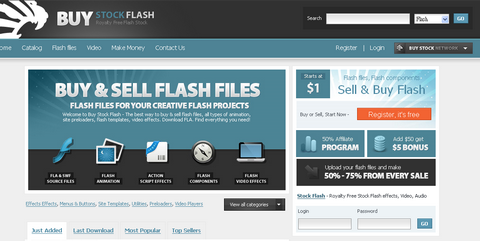 We had launched Brand new marketplace for flash files. FlashMarketplace.net high quality flash files for sale. 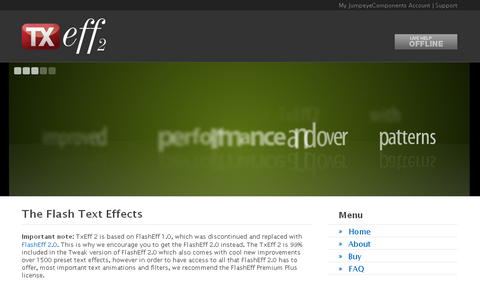 TextFF.com and FlashFF.com are just sites made by Jumpeye to promote their 2 components of the same names. They are not component directories. Impressive list; I had been thinking of getting into Flash a bit, and now I have the perfect list to do so. Great list of Flash component websites. A good collection of Flash components. activeden is my favorite. 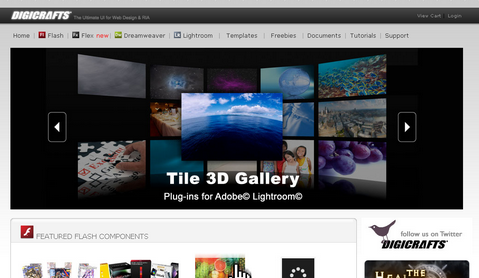 I see there a lot of free Flash COmponents!